Why the heck would Apple want to buy Hulu? I’ve lost track of the number of times I’ve heard that question since Bloomberg reported last week that the two companies were in early talks. Apple, with its already extensive iTunes Store catalog of TV shows and movies, would seem to be a strange bedfellow for the predominantly TV-streaming site that’s jointly owned by big media names like News Corp, Comcast, and Disney. While the attention has focused around why a Hulu-Apple deal doesn’t make sense, in some ways the two make perfect partners: Hulu has a large catalog of video content that consumers want to watch, and the licenses to stream them; Apple has proven experience in delivering content to users on a variety of devices. Despite what might seem like a considerable amount of overlap, there are good reasons why Apple might seriously consider acquiring Hulu. Really, though, it comes down to just one: Apple has done TV, but it’s never done it right. 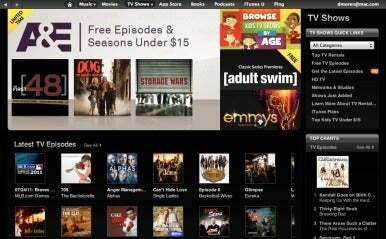 The iTunes Store has a wide catalog of TV content, but most of it is on a pay-per-view model. In terms of pure content, Apple doesn’t stand to get much from a Hulu deal that it doesn’t already have. Cupertino’s been making deals with television networks for nearly half a decade, and with a few exceptions, almost any show currently on television can be found in the iTunes Store. But in terms of delivery, it potentially gets quite a lot. According to the Bloomberg report, the deal would come with a five-year licensing extension, which would presumably cover streaming Hulu’s library of content. The first two years of that would be exclusive, as well. Apple’s embrace of streaming media delivery has been limited; whether for licensing or technology reasons, it’s largely focused instead on a pay-per-view, download model—though the company did start offering rentals of movies in 2008 and TV shows in 2010. But even the company’s newest online service, iCloud, relies on the idea of files that get downloaded to all of users’ different devices. Sales of movies and TV shows have not proved to be quite as rampantly successful as Apple might have hoped. The iTunes Store has been offering video content since 2006, but you’ll notice that the company rarely talks about the number of movies and TV shows that it delivers, instead focusing on the thriving sales of songs and apps. If nothing else, that should be an indication that video is not exactly a cornerstone of the company’s business. Meanwhile, companies like Netflix and Hulu have been attracting plenty of consumer attention (if not always profits to match). Hulu's streaming TV service has proved popular. Hulu would give Apple a strong position in the burgeoning streaming video business—the question is whether or not that’s a business Apple wants to be in. The Apple TV—specifically the most recent version, which places an emphasis on streaming over storage—suggests it does. While the company has continually described its own foray into the living room as a “hobby,” chief operating officer Tim Cook recently said that the company would continue investing in the device because it thinks there’s something there. But clearly, reading between the lines of Cook’s comment, it’s not all there yet. Some have suggested that Apple’s purposes might be just as well served by a deal streaming Hulu to the Apple TV, as Apple has done with Netflix. At a base level, that certainly might appease existing Hulu Plus subscribers—yours truly included—but there’s the risk that Apple might cannibalize its own video sales without necessarily driving enough Apple TV adoption to compensate. Owning Hulu would instead give Apple the power to shape the service to its own needs. From a business strategy point of view, you can’t ignore that there’s not only power in buying an established property, but also in denying it to your rivals. Apple snapping up Hulu prevents the company’s other potential suitors—Google, Yahoo, AT&T, and so on—from getting an instant leg-up in the video market. 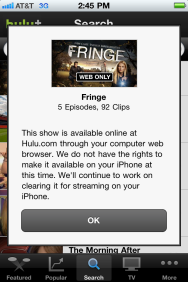 Given their contentious recent history, blocking Google alone might be enough reason for Apple to pick up Hulu. Despite trying to leverage the enormous popularity of YouTube into video rentals, Google has failed to establish a serious presence in the TV and movie delivery business. The company tried to launch its platform for set-top boxes, Google TV, last year, but the first device to appear was widely considered a flop. There’s little question that Google’s mobile platform trails behind Apple’s in terms of media; Google only recently launched its own service for delivering media to Android devices. Right now, Apple is the undisputed leader in delivering digital content to mobile devices, and that’s a position that it would do well to hold onto. Not only would buying Hulu strengthen Apple’s position against rivals looking to get into the video distribution game, but, given Hulu’s existing partnerships with other third parties, Apple could also potentially strike blows against current licensees like Microsoft (on the Xbox 360), Sony (on the PlayStation 3 as well as Blu-ray players and TV sets), Roku, Samsung, and others. Make no bones about it, there’s a zero-sum game here: Hulu’s owners are looking to divest themselves of the company and if Apple doesn’t buy it, someone else will—and then it might very well be Cupertino who gets the short end of the stick. 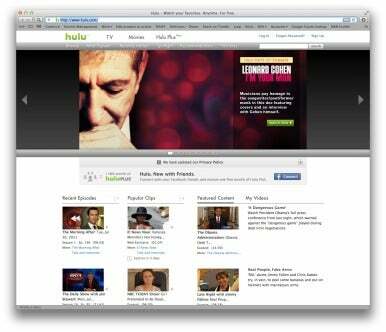 Hulu's somewhat bizarre device licensing wouldn't fly at Apple. Of course, Hulu clearly has its own problems; being acquired by Apple might be beneficial for the company, which has seen its share of friction between management and ownership. The content providers have increasingly hamstrung the service’s offerings; whereas it was once a simple matter to find and watch a show, consumers now have to contend with availability windows and Byzantine restrictions about which devices they can watch on. That wouldn’t fly under Apple rule. Devices are the company’s bread-and-butter, and I’d bet heavily that expanded licensing for streaming to devices would be a big part of any deal Apple tried to strike with Hulu’s owners. A streaming service whose prime focus is the Web wouldn’t fit very well with Apple’s business, but streaming TV shows to the iPhone, iPad, iPod touch, and Apple TV—well, that could prove very attractive indeed. How to make that argument to the content owners? Speak their language: money. With more than 220 million iOS devices out there, a streaming service for iOS users could prove lucrative—especially if it were tied into those iTunes accounts that all those users already have. The people who won’t be happy, of course, are the middlemen who currently deliver the content to your screens: cable and satellite providers. That’s where things get tricky, because the content providers have a vested interest in keeping the distributors happy. But Apple’s got a lever here, too: Government regulations on the recent merger of Comcast and NBC may mean that companies like Apple and Netflix must be offered comparable licensing terms to those offered to cable companies. The real potential win for Apple, though, is adding a subscription media service. The company hasn’t ever really, genuinely tried this model, unless you count the Season Pass offerings on the iTunes Store—and I don’t. But the value proposition of Hulu is a huge part of its success; people are used to watching their television for “free” by consuming ads, or by paying a monthly fee to a provider (or Netflix), or by buying DVDs of entire seasons (which, in many cases, you can still get more cheaply than an entire digital season on iTunes). Apple’s approach of à-la-carte purchases and rentals looks decidedly old-school for a company that’s otherwise in the forefront of the digital media revolution. 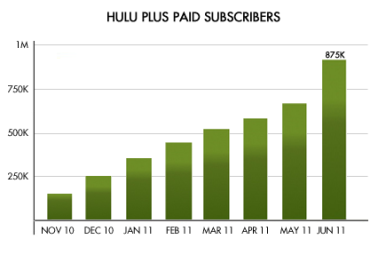 Hulu Plus has been gaining subscribers, though the total number pales next to iTunes Store accounts. Eight months into publicly offering its paid Hulu Plus subscription service, which gives access to more content as well as streaming on other devices, the company has racked up less than a million paid subscribers, though the adoption curve is apparently accelerating. While that may be small potatoes compared to the more than 225 million iTunes accounts Apple boasts, remember that in Hulu’s case each of those subscribers represents an actual recurring revenue of $8 per month. Such a monthly charge could be a nice addition to Apple’s bottom line—I’d suspect that it could bolster that fee a bit further if it were willing to step away from the ads that Hulu Plus still serves to paying viewers. In fact, I wonder if an Apple-run Hulu could step away from advertising altogether, in favor of an exclusive paid service. Paying $10 or $15 per month for access to a large catalog of streaming exclusively on iOS devices and the Apple TV might be quite an appealing proposition for many consumers. The real challenge to the future of video distribution comes not from traditional sources but from places like cable companies’ on-demand delivery and Netflix. And while at the moment, Netflix and Apple are allies in this fight against the content creators, I wouldn’t expect that state of affairs to last indefinitely, especially as Netflix is getting into the content production business itself. Nor is the acquisition without precedent. Apple acquired music-streaming site Lala in 2009, despite the fact that Apple’s hold on the music industry was largely unchallenged. In TV, it has no such dominance—the market remains heavily fragmented. So there are plenty of potential gains to be made. None of this is to say that Apple will absolutely buy Hulu; these are just early talks, after all. Buying Hulu would certainly be a gamble for Apple, but the bet is that the company could make Hulu a more attractive proposition than the content providers can running the site for themselves. As strange as that might seem, consider this: The content providers are neither media-delivery companies nor technology companies. Apple is both. So while it might not be time to break out the champagne just yet, it seems as though Hulu and Apple might just make the perfect couple.